Remember the Windows 10 April 2019 Update? Microsoft has now officially dubbed it the Windows 10 May 2019 Update, and plans to roll it out to Insiders next week alongside more permissive user controls than ever before. 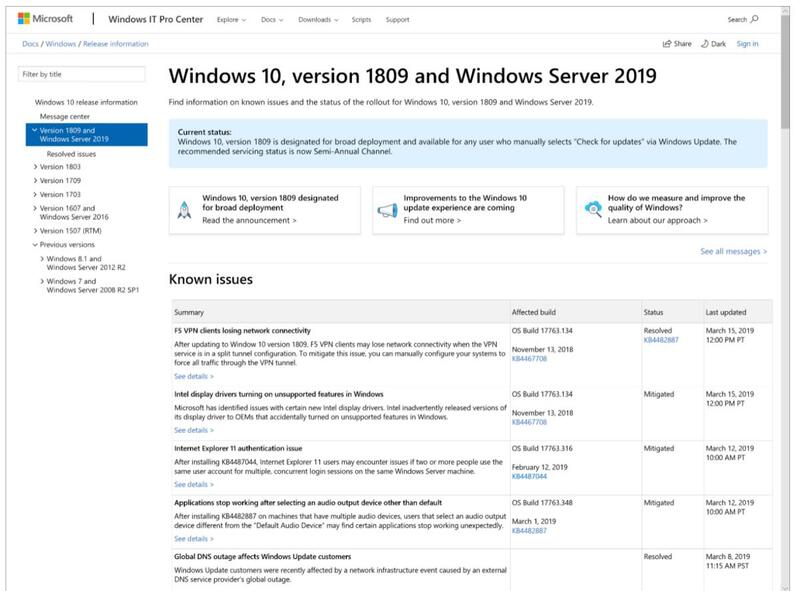 The Windows 10 May 2019 Update (also code-named “19H1,” or version 1903) will begin deploying to all PCs in late May, on a day that hasn’t yet been determined. But there’s something brand new: The update will specifically call out the feature release, and allow users to delay it—and any update, including security patches—for up to 35 days. Even better, Windows won’t decide when to install updates—you will, with an exception or two. “We will provide notification that an update is available and recommended based on our data, but it will be largely up to the user to initiate when the update occurs,” Michael Fortin, the Microsoft corporate vice president in charge of Windows, wrote in a blog post that was provided to PCWorld. Microsoft has at least two priorities for the May 2019 Update rollout: Put control over updates in the hands of the user, and minimize bugs. Microsoft plans to go slowly and carefully to avoid a repeat of the disastrous rollout of the October 2018 Update, which was re-released in November after the original update overwrote files on a small number of PCs. The severity of the bug prompted Microsoft to issue a public mea culpa and pledge to improve its testing procedures, the fruits of which Microsoft says you’ll see with the Windows 10 May 2019 Update. What this means to you: A combination of a cautious deployment and built-in features mean that Microsoft’s bending over backwards to ensure a smooth rollout. Known informally by some as the “updater’s update,” the Windows 10 May 2019 Update also includes specific features to help you manage Windows, which we’ll call out in our review. For example, intelligent Active Hours figure out when you’re not using your PC, and push updates then. One long-awaited feature simply puts an icon on your taskbar, quietly notifying you when a Windows update is ready to install. Microsoft’s Insider program will essentially test the May 2019 release candidate—build 18362—for longer than ever before: over a month, and through late May. Microsoft said in a blog post that it’s working with partners and customers to obtain more feedback on potential issues proactively, and using machine learning to sniff out and prioritize catastrophic bugs that may affect just a handful of users. That intelligence won’t just be applied to Windows’ built-in Feedback Hub, but also to Twitter and other social media. As the May 2019 Update draws closer to launch, Microsoft’s new strategy will become apparent. 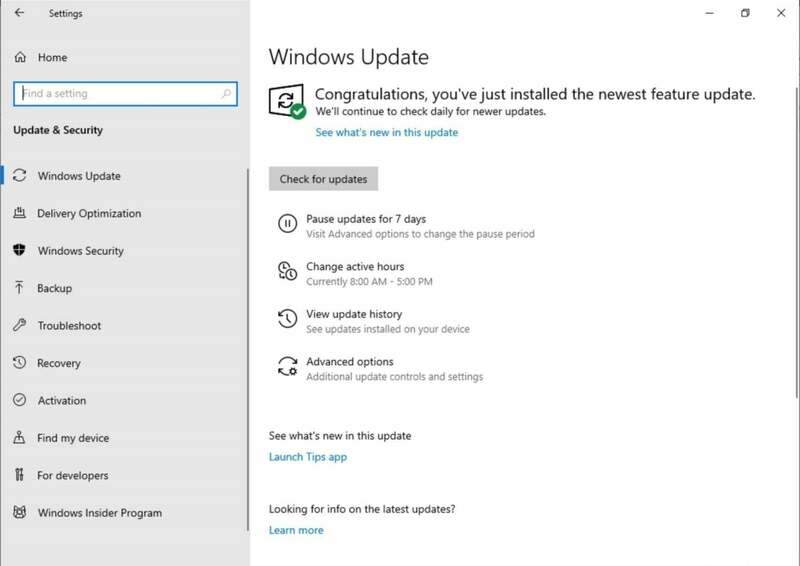 For one thing, anxious users who hammer the Update Now button in their Windows Update settings menu will receive the May 2019 Update first, as well as commercial customers and any devices nearing the end of their support phase. 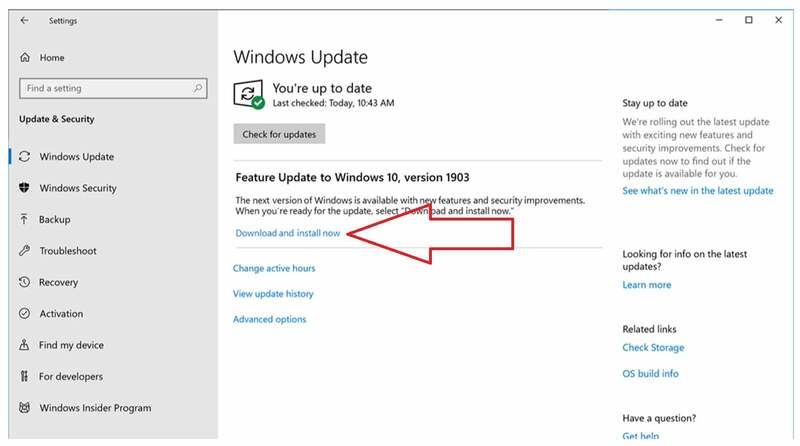 Microsoft’s Windows 10 May 2019 Update will add what’s essentially a second update button, specifically for downloading the latest feature update. Even if a feature release like the May 2019 Update is available, however, Windows will ask users to go through a second step to download it. Historically, Windows 10 feature updates and patches would install quietly in the background, announcing themselves once they were completed. Now, it appears that users will be able to decide when to install a feature release like the May 2019 Update. Users will also have more of a say as to when ordinary patches are applied, even security patches. Historically, only Windows 10 Pro users have been able to delay patches for a substantial length of time, leading to frustration on the part of Windows 10 Home users who lack the same Windows Update options. Now, both Home and Pro users will be able to delay patches for up to 35 days, though there’s one catch: Each “delay” will last only 7 days, although the process can be repeated manually five times. Once that 35-day window expires, however, users will have to install the patches that Windows asks them to, including feature updates. As before, patches that aren’t explicitly requested will download in the background. With the May 2019 Update, Microsoft is implementing what it calls “improved update orchestration” to download those patches when Windows knows you’re away from your PC, to minimize any load they place on your system. Though Windows team members have held many conversations about how to provide users an estimated time for those patches to be installed, that won’t happen with the May 2019 Update. Instead, we’re told that the median time for the May 2019 Update will be about 22 minutes, probably varying according to factors like CPU, storage type, and network bandwidth. 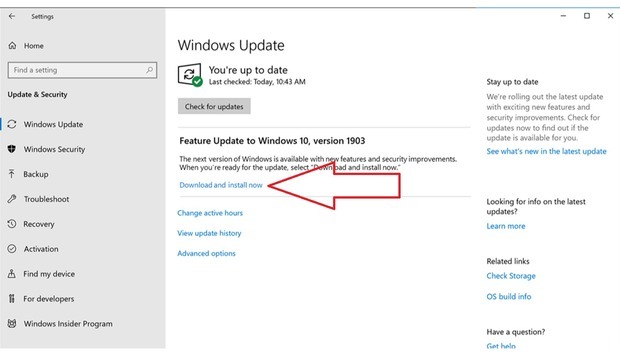 The ability to pause or delay updates is already prominently displayed within Windows Insider builds of 19H1, otherwise known as the Windows 10 May 2019 Update. The May 2019 Update also includes a bit of machine intelligence to set Active Hours automatically—the time during which you’re using your PC, and don’t want updates. In my tests with the 19H1 Insider builds, Windows hasn’t done a great job of figuring out when I’m actively using my PC. We’ll see if that improves. One outstanding question we weren’t quite able to nail down: How exactly will consumers know when the May 2019 Update is available? Microsoft has flirted with pop-up ads before, and consumers freaked out. It’s not exactly clear how Microsoft will promote the update this time around. Microsoft clearly hopes that the May 2019 Update proceeds smoothly. In the case that something does go wrong, however, Microsoft plans to add a Windows release health dashboard “that will empower users with near real-time information on the current rollout status and known issues (open and resolved) across both feature and monthly updates,” Microsoft says. Think of it as a more robust version of the Windows 10 update history page that Microsoft has already published. An example of the new dashboard. The new dashboard will be searchable via keyword and feature content like service and support updates, new blog posts, and the like. The content will be shareable via social media, Microsoft said. What can you expect in the Windows May 2019 Update? We’re already in the process of writing our review of the Windows 10 May 2019 Update—though the unexpected change in name means that some of our tips and feature reviews may refer to it as the April 2019 Update! 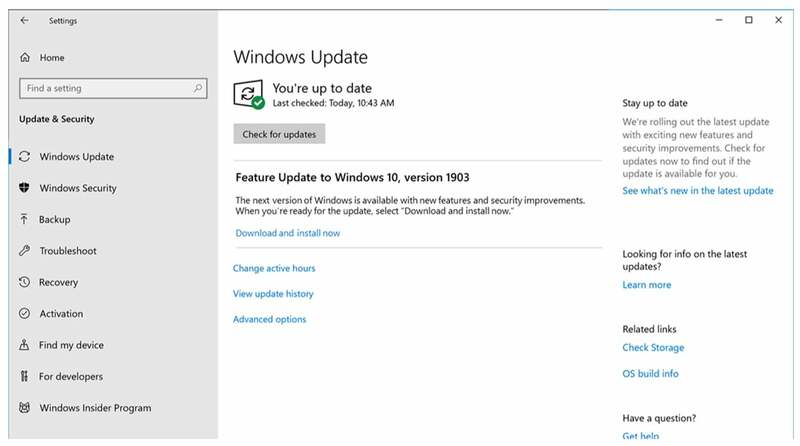 We’re happy to see that the May 2019 Update is sometimes referred to as the “updater’s update” at Microsoft, because many of the features simply improve the way Windows works. Besides the intriguing Windows Sandbox virtual testbed, little is new: there are some smarter troubleshooters and Windows Update logic that work behind the scenes, the separation of Cortana and Windows search, and more. Oh, and kaomoji support, too. Look for our review soon after the May 2019 release preview lands, sometime in the next week or two.